Set against the decaying halls of a San Diego rest home in the 1970s, God Clobbers Us All is the shimmering, hysterical, and melancholy account of eighteen-year-old surfer-boy orderly, Edgar Donahoe, and his struggles with romance, death, friendship, and an ill-advised affair with the wife of a maladjusted war veteran. All of Edgar's problems become mundane, however, when he and his lesbian Blackfoot nurse's aide best friend, Pat Fillmore, become responsible for the disappearance of their fellow worker, Beverley Fey, after an LSD party gone awry. 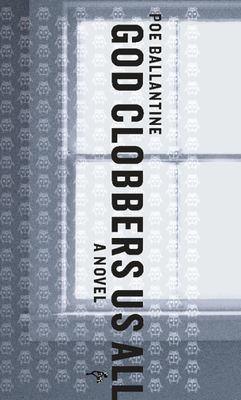 Ballantine's own brand of delicious quirkiness and storytelling is smooth and compelling, and God Clobbers Us All is guaranteed to satisfy Ballantine fans as well as convert those lucky enough to be discovering his work for the first time. POE BALLANTINE currently lives in Chadron, Nebraska. His work has appeared in The Atlantic Monthly, The Sun, Kenyon Review, and The Coal City Review. In addition to garnering numerous Pushcart and O. Henry nominations, Ballantine's work has been included in the The Best American Short Stories 1998 and The Best American Essay 2006 anthologies. I despise Poe Ballantine. He’s obviously stolen his style from Carson McCullers. traipsing onto the set of the Tonight Show that I’m going to be easy on him? I doubt if Truman ever read God Clobbers Us All. He was the same at Yaddo. Surfi ng? lsd? From which European suburb does this man hail? sentence. I’m a little lost on the radio reference, but fl attered nevertheless. incurring the accusation of being arbitrary, is that it be interesting. Mr.
Ballantine’s Divine Punishment breaches no appointment in this regard. will go down as one of the great characters of the twenty-fi rst century. I’d like to give Poe Ballantine some advice. The public is a dumb beast. We’d just love to have Mr. Poe at our table. I promise to keep Bob at bay. confectioner’s sugar, do you know the ones I’m talking about?